Busy week with just one finish, this commissioned baby quilt in a familiar pattern. 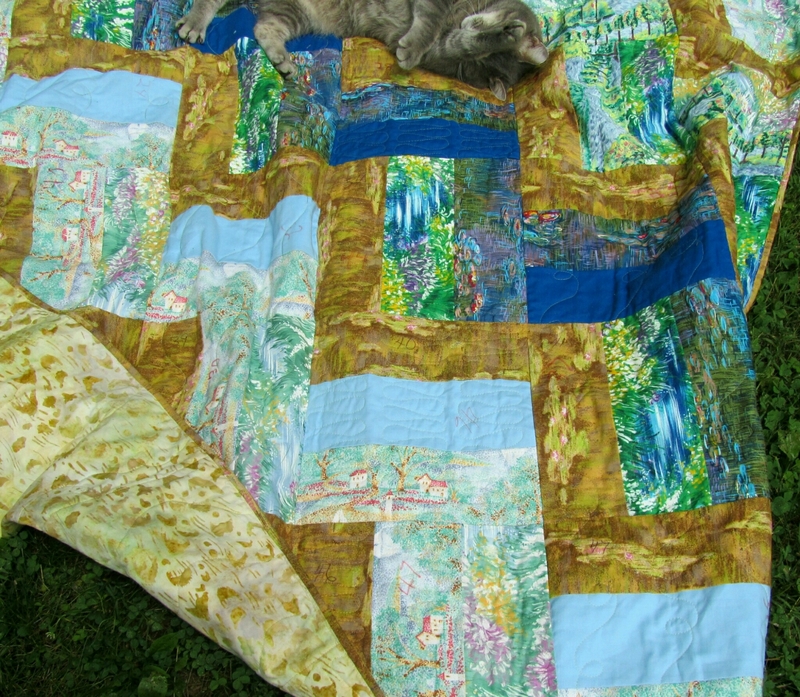 I did have to buy a yard and a quarter of the aqua chevrons for the backing, but the quilt used three and a half yards. 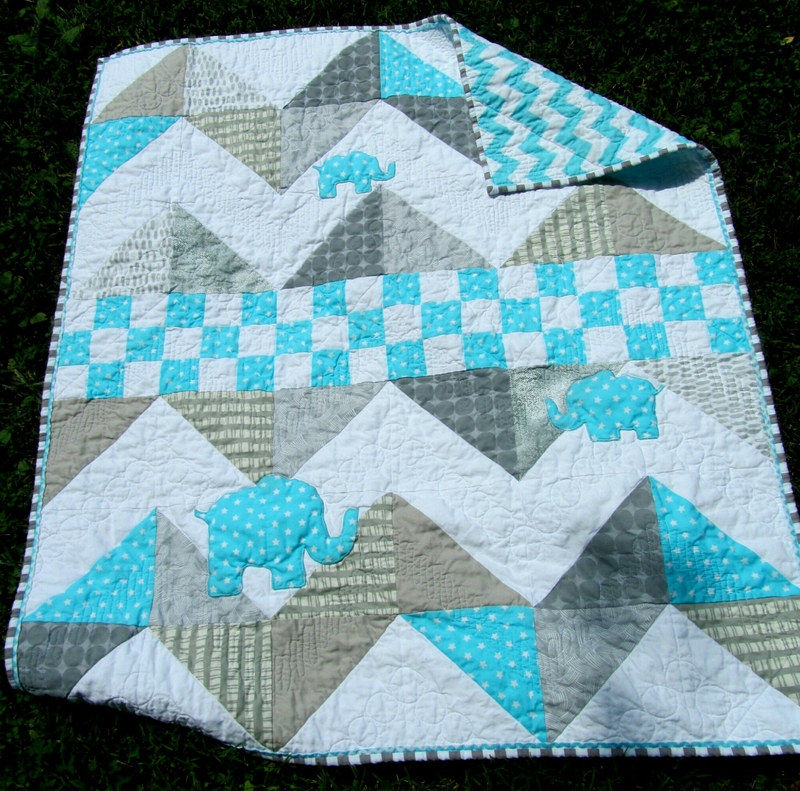 Categories: Finishes, Stash | Tags: baby quilt, elephant quilt, Evening in the Garden, Valerie Root | Permalink. Hot, hot here, but we did get an inch of rain this week from some lucky thunderstorms, so I can’t complain. My studio is too hot most of the day, but I worked by fits and starts today to make all the blocks for a new commisioned baby quilt. Yeah, same old chevron design. I’m waiting for people to get tired of it, but at least this one has a little more color. Watch this space. 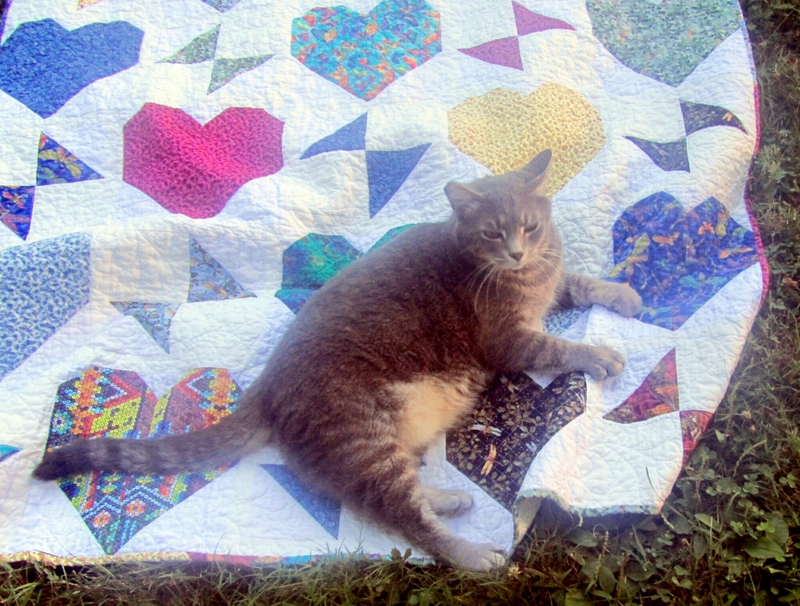 This week I bought two yards of fabric, but used five and a half for the Rainbow Hearts quilt, so that works. I think I’m on track to destash fifty yards this year. How are you doing? Keep cool (in the northern hemisphere!) and keep sewing! This my first Stash Report since the end of June. I tried to write one before I went traveling, but it repeatedly disappeared into cyberspace until I ran out of patience. I may have mastered the updated WordPress app now, so I’ll try again. My only finish so far this month was sizeable, at ten and a half yards. This the Impressionist Fabric donation quilt. I asked for suggestions for this fabric, and I did consider the ones I received. As I looked more at the fabric, I found that the prints were really only medium scale. More importantly, most had no center of interest, no pictures or scenes that could be centered in a block to any effect. So I went with my original thought to do large Rail Fence blocks (10″ finished). I also added a little Kona solid to counteract the busy-ness of the prints. 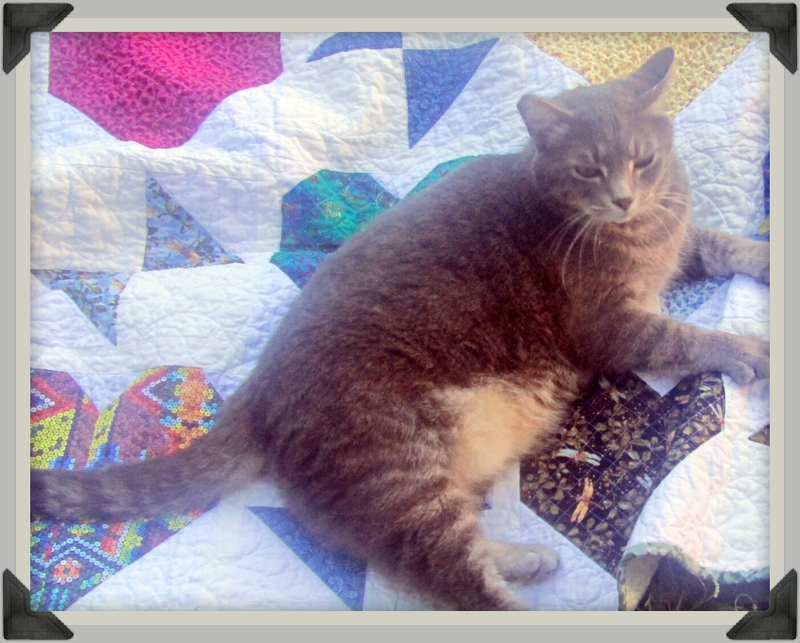 Yuri wants you to know that, in spite of extensive testing, this quilt was not as snuggly as usual. We scrambled to take photos before it rained, so it hadn’t been washed yet. Then we washed it up and sent it off to Quilts of Compassion to go to flood victims in West Virginia. We’re linking up to the Stash Report at Patchwork Times. 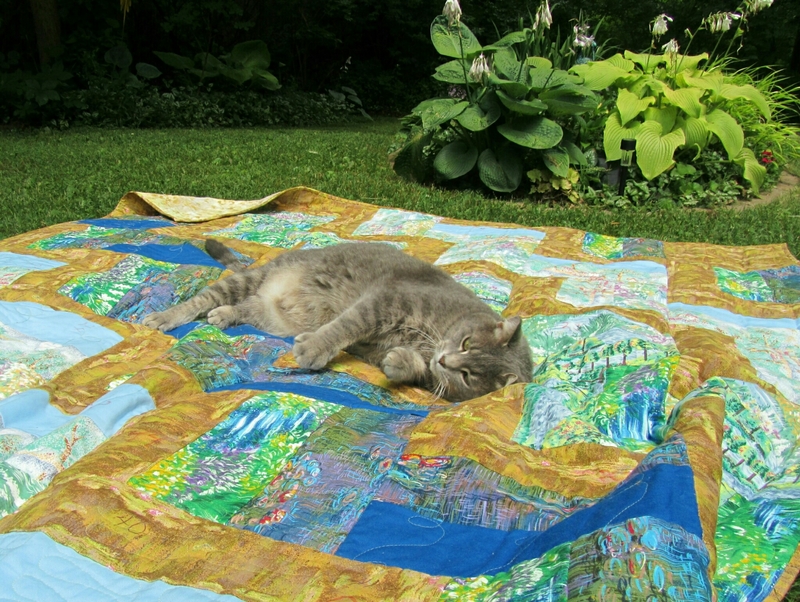 Categories: Uncategorized | Tags: Evening in the Garden, Rail Fence quilt, Valerie Root | Permalink. 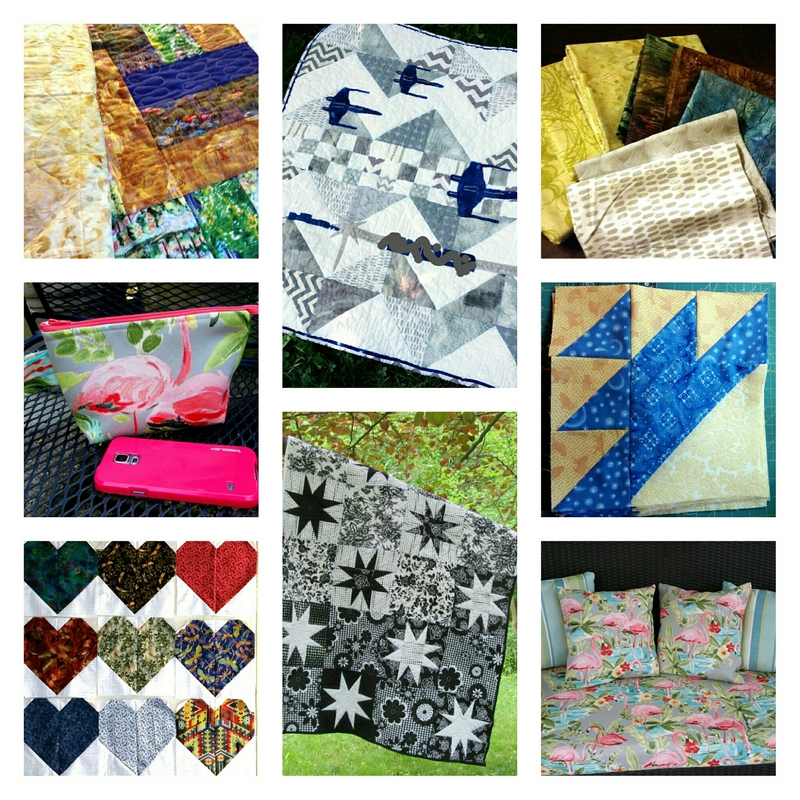 I’m late, I’m late, but I am here with my report, and linking up to Val’s Quilting Studio. I was away on vacation, but I’m back now, and I’ve counted my savings. The Official Pitcher was about 2/3 full of change and ones. (I make sure to place the change rather than drop it, as advised!) The grand total? $81.55! That should buy some Craftsy classes, huh? 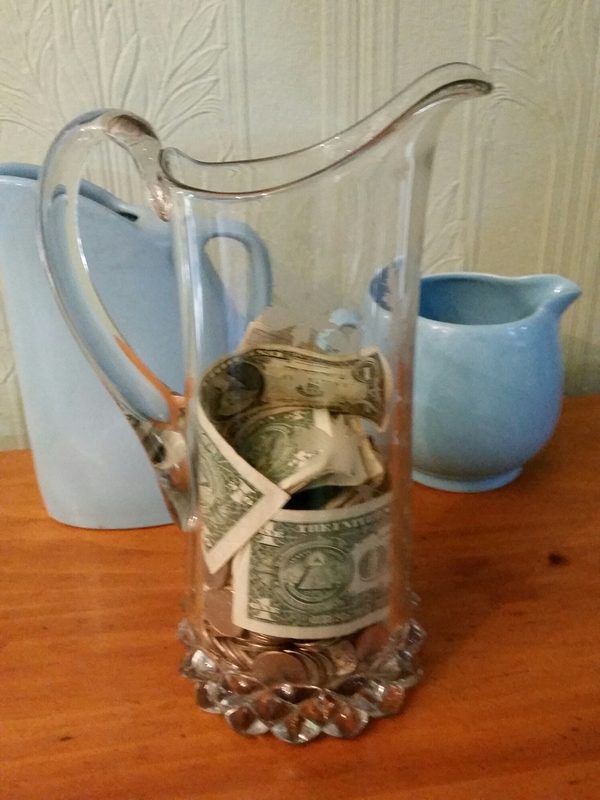 So, the Pitcher goes back into the china cabinet to start filling again. Are you saving with us this year? Categories: Uncategorized | Tags: Evening in the Garden, evvalerie root | Permalink. Lots of things were stared, worked on, or finished this month. They just weren’t what I had scheduled. Recover settee cushion for our deck. Yes! I procrastinated, but got it made, and two bonus pillow covers. Order fabric to finish Scrappy Stars Around the Corner. I’ll say “Yes”. 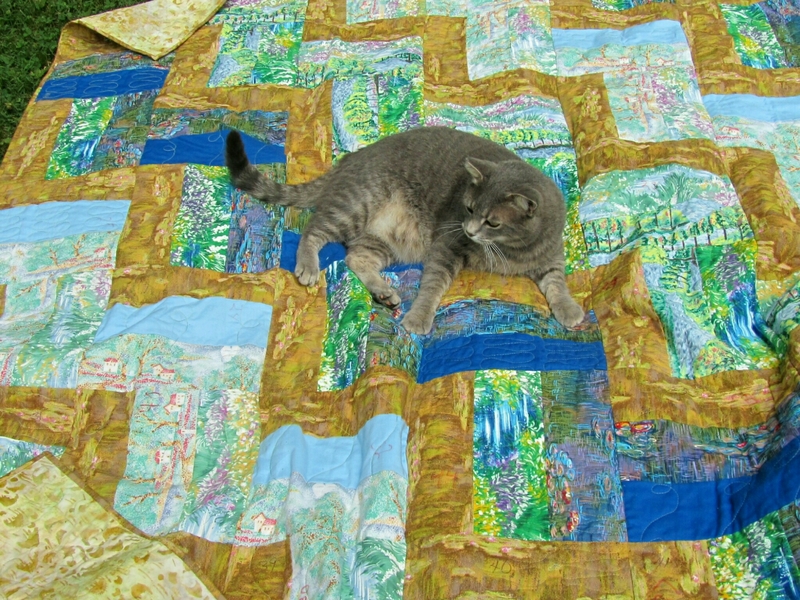 I can’t decide how large to finish this quilt, because I might change my mind about what to do with it. 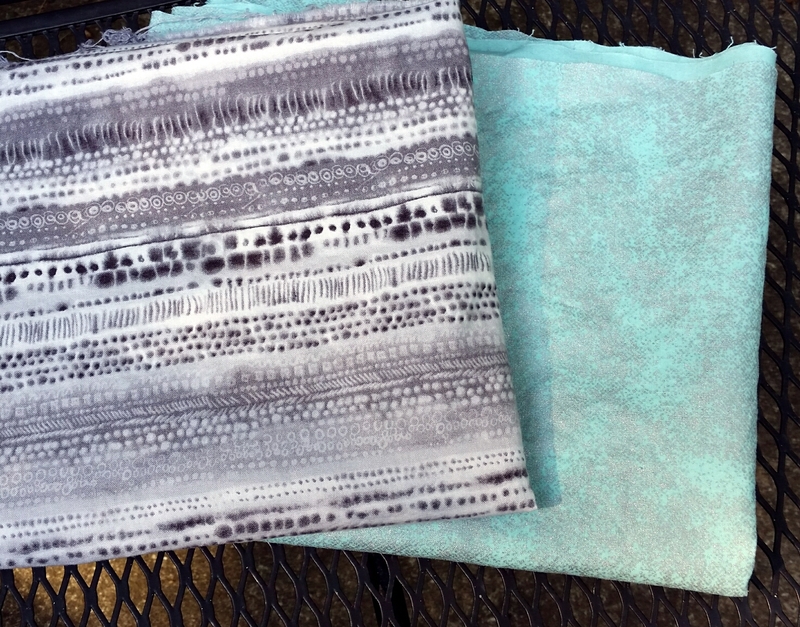 Instead, I bought fabric for backs for three other quilts. Hang photo in Studio, etc. No, I didn’t. Work on a new coastal themed art quilt. Nope. Make blocks for Kat’s June block drive. Yes! I finished the Black and White Baby Quilt. 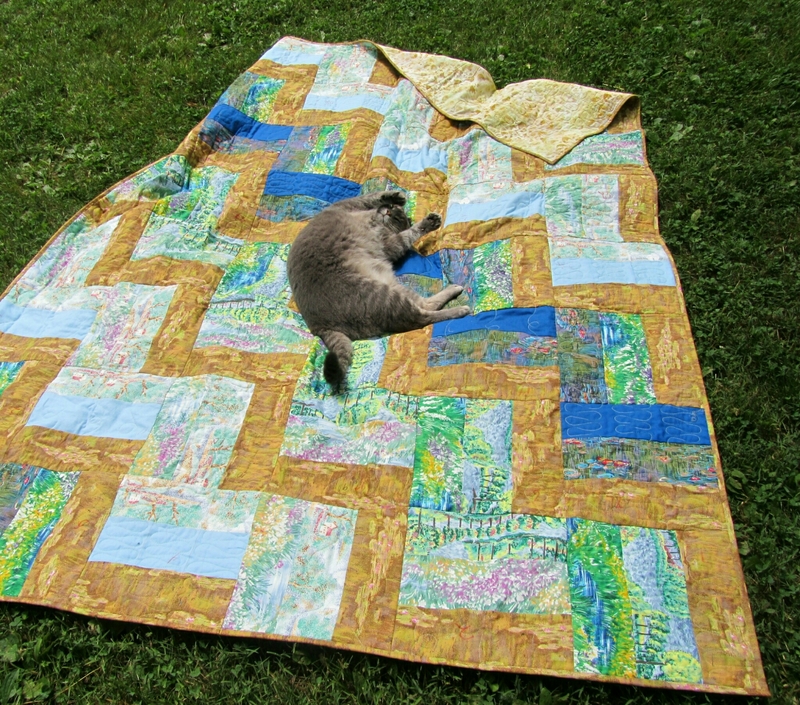 Sandwiched and started quilting the Impressionist Quilt. Made thirty blocks toward a quilt for Orlando. Sewed a little zipper pouch to carry my stuff to the Y. Made a commissioned Star Wars baby quilt. We’re going to travel again, I’ll only be home two weeks during July, so I have modest goals. Make the quilt for Orlando. Finish the Impressionist Quilt . Hang photo in Studio, etc.